One of the surest signs that a doll has been played with and loved to the nth degree is that she starts to show outward displays of over-handling and over-caressing. Little kids, especially, are guilty of "tattooing" their vinyl dolls with hand-drawn pictures, scribbling their name or the doll's name on legs and other limbs. Of course, a dreaded brother can "kidnap" a beloved doll and literally deface it by marking it up and leaving his calling card on its skin. All of us humans leave behind traces of our own sweat and oil when we play with a doll for any length of time. The oil allows dirt and debris to "stick" to the doll's vinyl skin. If the doll has just a light smattering of grime and looks a tad grungy, you can wipe down its skin with baby wipes. Be careful as you clean the doll's face. Don't use too much "elbow grease" when combating any grease or grime. If you clean too hard, you can accidentally ruin the doll's facial painting. Clean gently with baby wipes. Another way to clean the vinyl parts of a doll is with a washcloth that is damp (wring out all the excess water) and apply a tiny drop of dishwashing liquid to it. Anyone familiar with Dawn dishwashing products knows that the liquid detergent was used to clean off wildlife that had been trapped in oil slicks. It was gentle enough to salvage the feathers of ducks and other waterfowl. Dawn or other brands that are equally gentle can be applied to vinyl or plastic doll skin. Again, wipe gently. Don't scrub or be too rough in trying to clean a vinyl or plastic doll's skin. 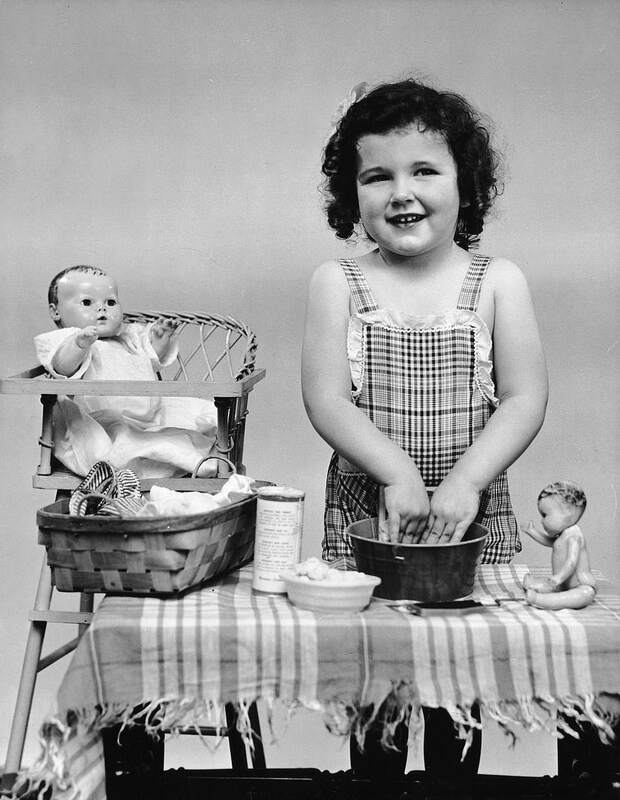 When you clean a doll's face, legs, or arms, it might be wise to remove the doll's clothing, so as to avoid getting the outfit wet. Next time you're shopping at Target or Walmart or some other big-box store, pick up a toothbrush that will be your daughter's doll's special brush. Nope, it won't be used to clean the doll's teeth--though if the doll's smile has been marked up, the brush can do the trick. Choose a soft-bristle toothbrush that will be utilized for going after dirt and grime that has hidden away in your doll's nostrils, ears, fingernail beds, and in between fingers and toes. A tiny bit of soapy water on a soft-bristle toothbrush can do the trick! If that doesn't help, then a moist toothbrush coated with a bit of baking soda can work wonders. Another doll-saving tool is also found in the dental aisle. Many doll collectors swear by the cleaning powers of whitening toothpaste. A tiny dab of the whitening toothpaste should be applied directly to the doll's skin where the dirt and markings lurk. Afterward, a cloth, which has been dipped in warm water and wrung out so it is not dripping wet, should be used to gently rub away the stain. If the marks and stains seem to be super heavy, apply the whitening toothpaste and let it "sit" for a minute or two. Then gently smooth away with your warm washcloth. You'll be a superhero for bringing the doll back to brilliant (and clean) life!